Nicholas Reeves is leaning on the entrance to Tutankhamun's tomb as he catches his breath. The British archaeologist has just finished a frantic couple of hours touring four royal tombs in the Valley of the Kings. They belong to Horemhab, Ay, Amenhotop and another tomb is given the number KV 55, all are contemporaneous to Tutankhamun and Nefertiti. But it is Nefertiti's long-lost resting place that is causing a stir, and Reeves thinks he knows where it is. Ahead of a press conference on Thursday where results from recent investigations will be announced, Ahram Online speaks to the man himself. Why did you insist on conducting examinations of Tutankhamun’s burial chamber before getting the security clearance from a radar device? I wanted to inspect, and to look for features on the west and north walls of Tutankhamun’s burial chamber which are not present in the digital photos on which I based my theory. I also wanted to examine the ceiling of the burial chamber because it could provide an initial indication of my theory's accuracy. Since the discovery of Tutankhamun’s tomb in 1922 nobody has ever examined the ceiling. What were your observations and to what extent do they confirm your theory? Investigations of Tutankhamun’s burial chamber ceiling prove that it extends beyond the northern and western walls, which suggests that something is hidden behind those walls. Also the four magical niches, installed on the walls of the burial chamber to protect the deceased, are not placed in precise locations in the middle of every wall of the burial chamber as usual. On the contrary, they are all over the place. This indicates that the ancient Egyptians have tried to avoid putting them on the partition walls in order to hide something. Why did you examine the tombs of kings Ay, Horemhab, Amenhotep II and KV55, given that you think Tutankhamun’s tomb could house Nefertiti’s resting place? I visited them because they belong to the same era as Tutankhamun and Nefertiti and are connected to them in one way or another. Inside these tombs I investigated the paintings, the interior design, the architecture and the location of the magical niches in order to compare them to those in Tutankhamun’s tomb. My examinations revealed that in the tombs of Amenhotep II and Ay the magical niches are evenly positioned as they should be, wunlike in Tutanakhamun's where they all over the place. This means that in Tutanakhmun’s tomb they are likely hiding something. In Horemhab’s tomb the wall at the far side of the well gives a good sense of what I think is going on with the northern wall of Tutankhamun’s burial chamber. The wall in Horemhab's tomb was originally completely decorated and hid access to deeper parts of the tomb. Hence most people who entered the tomb would not have realised there was a tomb behind that wall. I think that is the situation in Tutankhamun’s tomb, where we have a kind of blind wall which uniquely is still in one piece. If what I predict is correct, whatever stretches out behind it remains intact. To what extent did these observations confirm your theory? I think 60 percent but we're still in a hypothetical stage, and people should be excited until the end of November when scientific tests and radar investigations will take place. The world should stand still. Where we have got to now is just step one. In my opinion it is a brilliant theory, but concrete evidence could show it to be false. The best theories don’t always work. Have your field examinations confirmed that it is Nefertiti’s crypt? Not at all, but I didn't find anything that changed my opinion. All the features on the mummy depicted on the northern wall point to Nefertiti. It is unlikely you would have a wall with an image that look likes Nefertiti. The wrinkles of the face and the concave neck show the mummy belongs to a woman not a man. Meanwhile, the man in the scene carrying out the opening of the mouth ritual, labelled here as Ay, has the facial features of Tutankhamun when he was a child. It is an Amarna period child. We know that Tutankhamun succeeded Smenkare - who I hold to be Neferiti - therefore I cannot find any other answer to explain this. Would radar scans give concrete answers? Radars are tricky, especially in this kind of stone terrain with lots of reflections and cracks inside. We need skilled and experienced radar experts. We're talking with a Japanese expert who I think is outstanding. He is also an archaeologist who has uncovered several sites in Japan and South America. Here in the Valley of the Kings, tomb number KV 63 was uncovered by an American archaeologist thanks to radar survey. How can you be sure of the radar’s findings? I will go wherever evidences and radar results take me. If the radar indicates the existence of chambers behind the walls, we will confirm the investigations. We have to be very careful inserting the device as the vibrations from probing could cause damages to the cliff, the tomb or even to an undiscovered tomb. The Valley of the Kings still hides secrets. If the radar does show hidden chambers, how would you display them to the public? 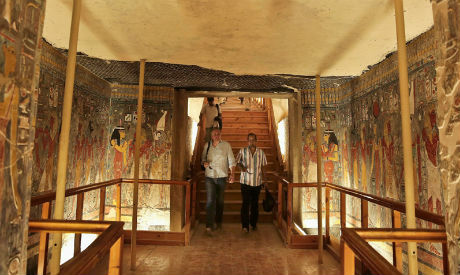 The scientific and archaeological committee of the project would find an appropriate method of displaying them without damaging the painted walls of Tutankhamun’s burial chamber. One idea is to cut the fresco paintings off the walls and display them in a museum, perhaps in collaboration with Italian experts who used the technique in Pompeii. That is no easy task but could be done if necessary. What you will say in the press conference tomorrow? Antiquities minister Mamdouh Eldamaty will talk about the results of our examinations. I will give a 45 minute lecture including a Powerpoint presentation of data concerning the west and north walls of the tomb. I'll go further and explain step-by-step how finding a new section will bring us closer to Nefertiti’s final resting place. So people will understand my theory better and form their own conclusions. What would you say to those archaeologists who claim your theory is old and was previously launched by British Egyptologist John Romer, who didn't find anything? I don’t remember that. What I do know is that Romer was interested in uncovering the tomb of Haryhor of the 21st dynasty. I was not aware that Romer was interested in the Amarna period.